What have plush toys and jukeboxes in common? The answer isn't easy and not difficult either: "Nothing on one side - a lot on the other." Both, jukeboxes and plush toys are beautiful. They bring joy. You can collect them, be proud of them, show them to friends, and share the joy. They distract but point to the essential as well. Jukeboxes did influence culture for many decades. It was impossible to imagine daily life without them. Even in dreary times, jukeboxes brought colourful entertainment and allowed people to dream. They belonged to every location like tables and seats and did characterize generations of old and young. Plush toys provide security and solace to children. They are real companions through every days life. They are true friends, and this often lifelong. Jukeboxes and plush toys can make great gifts. Some man and woman like to buy jukeboxes for themselves, sometimes he gives her or she gives him a jukebox. Same thing with plush animals. Give your wife, girl friend, mother, daughter, sister, mother in law or colleague an animal to cuddle. Give your husband, father, uncle, son, grandson or friend a Kösen or Steiff toy. Or simply make yourself a gift! Free shipping within Germany on all Kösen and Steiff items! Reduced shipping costs for all countries out of Germany. Order Kösen plush toys here. In any case you will make a child happy: Plush-Toys for a good cause! Once a year we will donate the proceeds from the sales of the Kösen and Steiff animals to a child aid foundation. That way you will give joy twice when you buy a Kösen animal. At the end of the year all customers who have bought an animal will get a note about the total we can donate. Also we will give details about the charity organisation we did choose. The proceeds from the sales in 2014 were donated to Trauerland e.V. in Bremen and to a parents' initiative for children with cancer Elterninitiative Kinderkrebs. The proceeds of 2015, 2016, 2017, and 2018 had been donated to "Peace Village International" who takes care of injured children from war-torn regions and crisis areas. We will do so too with the proceeds of this year following the motto by famous writer Erich Kästner "There is nothing good unless someone does it." >>> Order here plush toys of the manufacturers Kösen and Steiff. We promise: We stay on the ball with jukebox parts. And at the same time we like to take part of the responsibility for our children in a difficult life situation. Children mean future to all of us. That's why we added the Koesen and Steiff plush animals to our assortement: To collect money for a children charity organisation. Being elaborated hand-made items it's a pleasure to offer and promote these lovely plush animals. There are humans behind each animal who design and create them. Each animal is individual and not part of a mass-production. About Kösen: For more than 20 years the German toy manufacturer "Kösen" produces lifelike high quality soft toys, fairy-tale characters and textile dolls. 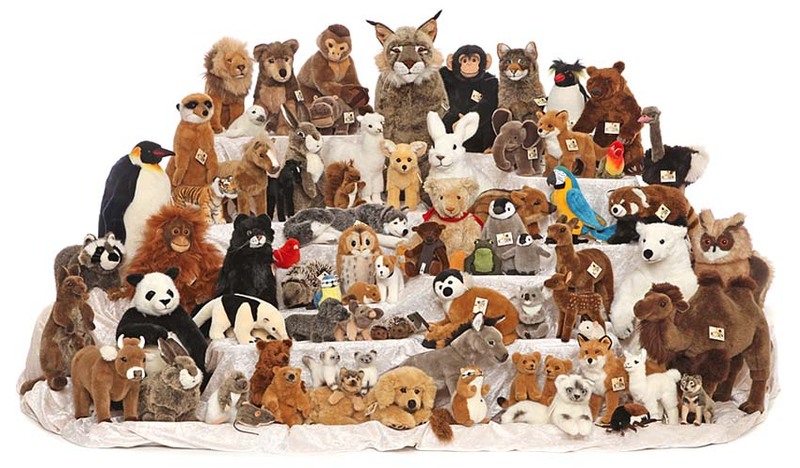 Among experts, collectors, and enthusiasts, the collection of plush animals is known to be one of the best in the world. Many animals received design awards and have been awarded "Spiel Gut" destinction. 20 years with a tradition of 100 years – how does this match each other? In 1912 Käthe Kruse founded her first workshop for dolls in Bad Kösen. WW II, expropriation and the turnover into a VEB (state-owned) enterprise did bring great changes and Kathe Kruse left Bad Kösen for Western Germany in 1951. Firstly the production of Käthe Kruse-styled dolls remained in the old factory but a few years later plush stuffed animals became the main focus. After the reunion of East and West Germany the Kösen manufacturer produced in commission of Steiff, but was threatenedfor being closed. In 1992 Helmut Schache took over the Kösen manufacturer which is continued by his daughter Constance Schache until today. Of course all stuffed animals fulfill the European safety regulation EN71 and are certificated with CE. This gets verified regularly by technical inspections. But already when choosing the material, it is ensured that the faux fur is without any harmful content. All soft toys can be washed at 30°C. Order here Kösen plush toys. About Steiff: Magarete Steiff, born in 1847, founded her own manufacture for producing clothes and household items after becoming a professional dressmaker. It is not only remarkable being a woman but more since Margarete suffered from polio at the age of 18 months. Her legs were paralysed and moving the the right arm was painful. A cutting pattern of a small elephant as a cushion for needles did inspire her, but it found more attraction to children as a toy. This elephant became the base for producing stuffed toys. In 1902 the first teddy bear with moveable joints got developped and presented on the toy fair in Leipzig. This is when the worldwide career of the teddy bear started. Two years later the trademark "Button in Ear" was born and remains until today. Of course all stuffed toys fulfill the European safety regulation EN71 and are certificated with CE. This gets verified by technical inspections regularly. But already when choosing the material, it is ensured that the faux fur is without any harmful content. All soft toys can be washed at 30°C. It still remains: Quality Made in Germany! Plush toys for a good cause - follow the logos below. Learn more once again about the Peace Village International.